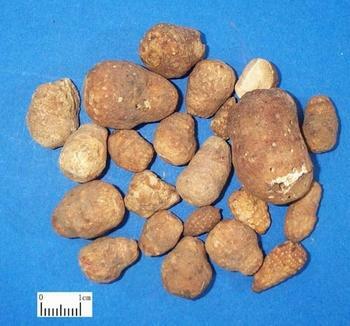 The dry tuber of perennial herbaceous plant Typhonium giganteum Engl. of family Araceae. Henan, Gansu and Hubei provinces in China. Light smell and taste, spicy to stimulate the tongue. Processed with alum and ginger juice. Pungent, warm, toxic; liver meridian entered. Dispel wind-phlegm, dry damp-phlegm, stop spasms, alleviate pain, relieve toxicity and dissipate nodulation. This herb has similar action to Tian Nan Xing as the key herb of treating wind-phlegm. For deviated mouth and eyes of stroke, it is usually combined with wind-extinguishing and collateral-dredging herbs such as Quan Xie and Jiang Can. For excessive wind-phlegm accumulation, clonic convulsion of epilepsy, it is combined with Ban Xia and Tian Nan Xing in order to enhance the actions of dispelling wind, drying dampness and resolving phlegm. B. Headache due to phlegm syncope, vertigo and arthralgia. This herb is capable of both dispelling wind-phlegm and alleviating pain especially for the facial diseases. The pungent and warm property confers it dissolving and dredging actions. So it can dispel wind-dampness, relieve arthralgia and is indicated for wind-cold-damp arthralgia, aching pain and dysfunction of flexion and extension of joints. For headache due to phlegm induced syncope and vertigo, it is combined with phlegm-resolving and adverse rise of qi-checking herbs and wind-extinguishing analgesics such as Ban Xia and Tian Nan Xing. For wind migraine, it is combined with Bai Zhi to enhance the actions of extinguishing wind and alleviating pain. In order to enhance the actions o[ dispelling wind-damp and relieving arthralgia, it is usually combined with wind-damp-dispelling herbs such as Du Huo, Qiang Huo and Wei Ling Xian. This herb also relieves toxicity and dissipates nodulation. For scrofula and phlegm nodule, the fresh herb is smashed and used externally or combined with other phlegm-resolving and toxicity-relieving herbs. Decoct 3~5g. Make powder and take 0.5~1g, better used processed. Proper dose for external application. This herb is pungent, warm, dry and drastic. So it is not suitable for yin deficiency and blood deficiency or exuberant heat with stirring of wind and the pregnant women. Unprocessed herb should not be taken orally.